Bánh Xèo gets its yellow hue from the turmeric and is flavored with coconut milk. 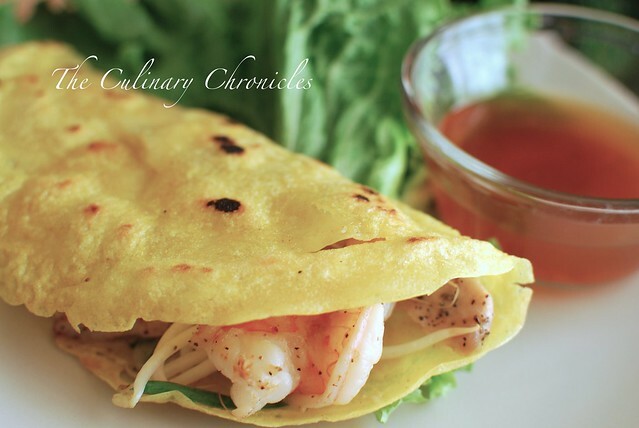 Traditionally, Bánh Xèo is filled with pork, shrimp, onions, mung beans, and bean sprouts. And just like chả giò (egg rolls), you wrap pieces of the Bánh Xèo with herbs and lettuce leave before dunking it into Nước Chấm–a fish sauce based dipping sauce. 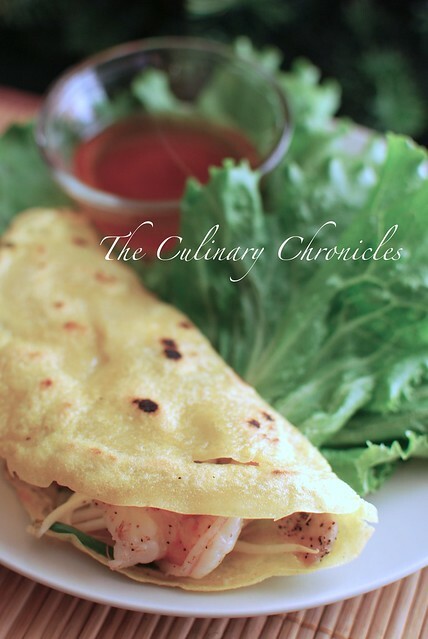 The freshness of the veggies is the perfect balance to the slightly fried crêpe. In a large bowl, whisk together the rice flour and turmeric. Add in coconut milk and mix until well combined. Slowly whisk in the soda water until all the lumps have dissolved. Whisk in Nước Mắm and scallions. Set the batter aside for 30-45 minutes. Prepare the Nước chấm. Combine Fish Sauce, Sugar, Lime Juice, Warm Water and stir until sugar is dissolved. Add in chilies. Cover and set aside. In another bowl, add in pork and shrimp. Toss with garlic, white onions, a few splashes of Nước Mắm, and pepper. Heat a pan with a few tablespoons of oil to medium-high heat. Add the mixture and cook for a few minutes until the pork and shrimp are almost done. Remove from pan. In a large nonstick skillet, add 1-2 tablespoons of oil. Stir the batter and carefully spoon a ladleful into the skillet. Tilt and swirl the pan to coat the bottom evenly. After 1-2 minutes, place some of the pork/shrimp mixture on one half of the skillet. Top with the bean sprouts. Cover and cook for 1-2 minutes. Remove lid and drizzle a little bit of oil on the outer edge of the crêpe. Cover the skillet for another 2-3 minutes. Using a spatula, carefully fold the crêpe in half, gently pressing down on top. Transfer to a plate. Serve with lettuce, mint, cilantro, thai basil and nước chấm (dipping sauce). This is my submission to the final Delicious Vietnam—a monthly blogging event celebrating Vietnamese cuisine started by Anh of A Food Lover’s Journey and Hong & Kim of Ravenous Couple. Thank You Anh, Kim, and Hong! Previous Post Ring in 2012 with Red Wine Sangria! Oh heck yeah!! I want to make this soon! I want Curtis to try it too. 🙂 Thanks for posting this, Nam. Hope your New Year is amazing!!! It’ll have to be one of those days when I make two meals though. My Mama does not like shellfish! (Sometimes I’m not sure where I came from, LOL). I’m in love:) That looks great. Not knowing Vietnamese, it was fun to learn about sizzling Xeo!